Our patented PCR-based KASP genotyping chemistry comprises of three components sample DNA, KASP assay mix, and KASP Master mix which contains two universal FRET cassettes. KASP on Demand includes design, full validation and optimisation of your assay by our scientists prior to delivery. For human research applications it is advisable to use KOD. KASP by Design (KBD) consists of three KASP primers that are specific to the SNP or InDel of interest. Order our unique KASP™ formulation for use with the specialist optics and reduced sample volumes used in the Fluidigm genotyping system. Validation service is available. Pre-validated SNP genotyping assays for human, rat, mouse, wheat, maize, tomato & others. Powered by KASP, our accurate & cost-effective genotyping chemistry. 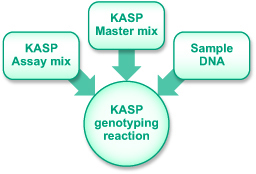 KASP™ is our proprietary genotyping technology. KASP Master mix and KASP Assay mix are used in-house for our genotyping service projects but can also be purchased to run KASP genotyping reactions in your own laboratory. The KASP Assay mix is specific to the SNP or InDel to be targeted and consists of two competitive, allele-specific forward primers and one common reverse primer. Each forward primer incorporates an additional tail sequence that corresponds with one of two universal FRET (fluorescent resonance energy transfer) cassettes present in the KASP Master mix. All custom KASP assays are available with the additional assay validation service. KASP Master mix contains the two universal FRET cassettes (FAM and HEX), ROX™ passive reference dye, Taq polymerase, free nucleotides and MgCl2 in an optimised buffer solution.